Horizon 2020 is a new EU research and innovation program with around €80 billion available over the period from 2014 to 2020. At the moment 70 Israeli companies participate in 212 projects under the Horizon2020. HERE you can find an excel file that is an outcome of ECCP’s research with the list of Israeli entities participating in Horizon 2020, their european partners and amount of money allocated to Israeli companies and institutions. During the previous EU research framework program, the FP7, Israeli entities participated in over 1500 projects. During FP7 Israel contributed €535 million but received funding worth €840 million ($1 billion) from that program. Elbit Systems is Israel’s leading military technology and weapons company. It’s Hermes 450 and Hermes 900 Unmanned Aerial Vehicles (UAVs or ‘drones) are widely used during Israel’s military assaults on Gaza and have been documented by Human Rights Watch as being used by the Israeli military to deliberately attack Palestinian civilians. In the wake of last year’s attack on Gaza, in which civilians were deliberately targeted using drones, Elbit Systems participated in a number conferences aimed at showcasing technologies used during the attack. According to research compiled by the Norwegian government that led to the government divesting its sovereign wealth fund from the company, Elbit Systems supplies an electronic surveillance system called ‘Torch’ for Israel’s illegal separation wall on an ongoing basis.The Norwegian government and several European banks have divested from the company due to these forms of complicity with Israeli violations of international law. Elbit has recently been approved to take part in FLYSEC, a Horizon 2020 security research program. Israel Aerospace Industries is a major manufacturer of drones used by the Israeli military. Its drones are also widely used during Israel’s military assaults on Gaza and have been documented by Human Rights Watch as being used by the Israeli military to deliberately attack Palestinian civilians. Israel Aerospace Industries is a key partner in the construction of Israel’s illegal separation Wall. The institute conducts a wide variety of research into technology and weapons used to oppress and attack Palestinians. For example, Technion researchers have developed special unmanned vehicles that aid the Israeli army in destroying Palestinian houses. The institute also provides specially tailored courses and programs for military officials and Israeli arms company executives. Technion has a history of deep collaboration with Elbit Systems. One of the university’s campuses has expanded on to occupied Palestinian territory in a confiscation of Palestinian land. Some of the university owned student quarters are located in a settlement neighbourhood of occupied Palestinian East Jerusalem. In addition, the Hebrew University maintains close ties with the Israeli military. All Israeli military colleges and training facilities are under the academic auspices and responsibility of the Hebrew University. The university trains soldiers in sciences and technology and hosts a military base on its campus. The Hebrew University of Jerusalem participates in 126 FP7 projects. Through its deep links with the Israeli military, the university is directly complicit with violations of international law and abuses of human rights, including those that took place during the 2008-09 assault on Gaza. Motorola Solutions Israel is a full subsidiary of the giant electronics and telecommunication corporation Motorola Solutions. In 2005, the company has won a tender of the Israeli Ministry of Defence, to provide virtual fences to Israeli settlements which refused to fence themselves. According to news reports, a Motorola radar detectors’ system has been installed in some 47 Israeli settlements in the occupied West Bank. The system is also used in the Separation Wall complex, in the wall around Gaza, and in military bases. 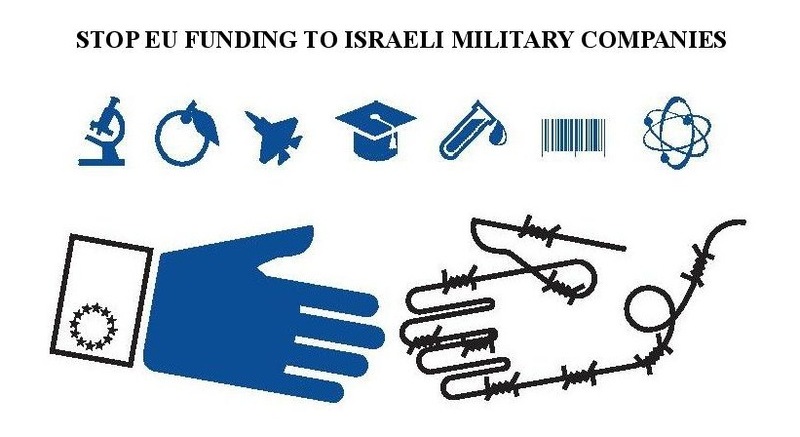 By allowing these companies to participate in EU research programs, the EU providing Israel with the political, material and financial support that it needs to continue to violate international law. The Horizon 2020 code of ethics states that research carried out under Horizon 2020 should have an exclusive focus on civil applications and that research activities should comply with the European Convention on Human Rights. The Horizon 2020 ethics framework relies heavily on self-assessment and reporting by program participants and involves little rigorous investigation by the EU. #Note: all data on funding awarded was obtained from database published by the EU via the Cordis website.